Although not everyone knows the name David Macaulay, most people are familiar with his classic book, The Way Things Work. This month Macaulay has published a new book in which he turns his architect’s intellect to a different kind of construction: the human body. Macaulay’s The Way We Work, published by Houghton Mifflin, takes readers on an excursion down arteries and deep inside the lungs. Macaulay appears on Sunday, October 26, 2008, at Zilkha Hall, Hobby Center for the Performing Arts, 800 Bagby, at 3 pm. Cool Brains! 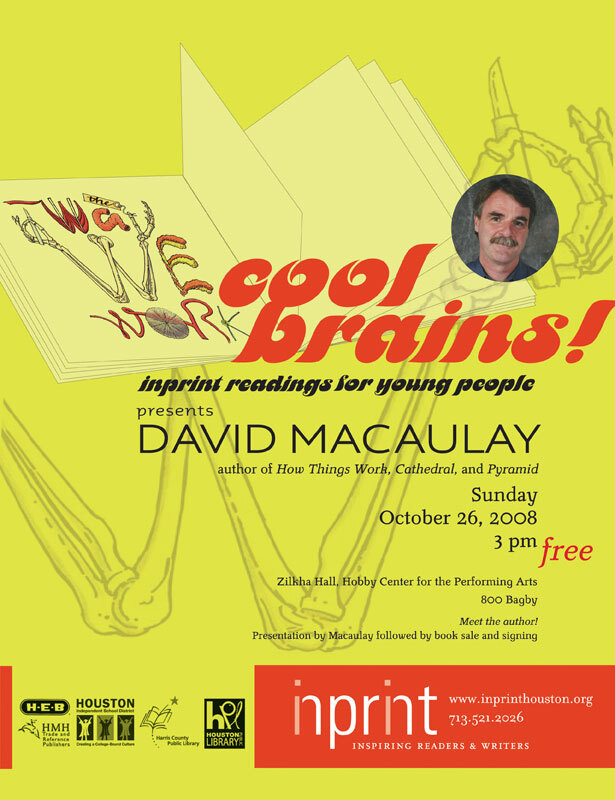 Inprint Readings for Young People is presented by Inprint, a Houston-based nonprofit dedicated to inspiring readers and writers. For more information about this free program, click here.